Rangoli, a popular form of Indian Sand Paintings, in Singapore. Sandpainting is the art of pouring coloured sands, and powdered pigments from minerals or crystals, or pigments from other natural or synthetic sources onto a surface to make a fixed, or unfixed sand painting. Unfixed sand paintings have a long established cultural history in numerous social groupings around the globe, and are often temporary, ritual paintings prepared for religious or healing ceremonies. It is also referred to as drypainting. Drypainting is practised by Native Americans in the Southwestern United States, by Tibetan and Buddhist monks, as well as Australian Aborigines, and also by Latin Americans on certain Christian holy days. In the sandpainting of southwestern Native Americans (the most famous of which are the Navajo (known as the Diné)), the Medicine Man (or Hatałii) paints loosely upon the ground of a hogan, where the ceremony takes place, or on a buckskin or cloth tarpaulin, by letting the coloured sands flow through his fingers with control and skill. There are 600 to 1,000 different traditional designs for sandpaintings known to the Navajo. They do not view the paintings as static objects, but as spiritual, living beings to be treated with great respect. More than 30 different sandpaintings may be associated with one ceremony. The colours for the painting are usually accomplished with naturally coloured sand, crushed gypsum (white), yellow ochre, red sandstone, charcoal and a mixture of charcoal and gypsum (blue). Brown can be made by mixing red and black; red and white make pink. Other colouring agents include corn meal, flower pollen, or powdered roots and bark. The paintings are for healing purposes only. Many of them contain images of Yeibicheii (the Holy People). While creating the painting, the medicine man will chant, asking the yeibicheii to come into the painting and help heal the patient. When the medicine man finishes painting, he checks its accuracy. The order and symmetry of the painting symbolise the harmony which a patient wishes to reestablish in his or her life. The accuracy of a sandpainting is believed to determine its efficacy as a sacred tool. The patient will be asked to sit on the sandpainting as the medicine man proceeds with the healing chant. It is claimed the sandpainting acts as a portal to attract the spirits and allow them to come and go. Practitioners believe sitting on the sandpainting helps the patient to absorb spiritual power, while in turn the Holy People will absorb the illness and take it away. Afterward, when the sandpainting has served its purpose, it is considered to be toxic, since it has absorbed the illness. For this reason, the painting is destroyed. Because of the sacred nature of the ceremonies, the sandpaintings are begun, finished, used and destroyed within 12 hours. The ceremonies involving sandpaintings are usually done in sequences, termed "chants", lasting a certain number of days depending on the ceremony. At least one fresh, new sandpainting is made for each day. Women of child-bearing age are not supposed to sing the chants associated with the yeibicheii. This is both because the ceremony has a possibility of injuring an unborn child, and because of a taboo preventing menstruating women from attending. (Some cultures considered menstruation and presence of blood to be powerful spiritual events that had to be restrained, as they represented life forces.) Post-menopausal women are more likely to be chanters or diagnosticians. Authentic sandpaintings are rarely photographed, so as to not disrupt the flow of the ceremony. For many reasons, medicine men will seldom allow outsiders inside a sacred ceremony. Because so many outsiders are curious about sandpainting, some medicine men may create pieces for exhibition purposes only, using reversed colours and variations. To create an authentic sandpainting solely for viewing would be a profane act. The sandpaintings for sale in shops and on the Internet are commercially produced and contain deliberate errors, as the real sandpaintings are considered sacred. The earliest credited instance of traditional Navajo sandpaintings (being rendered in coloured sands as opposed to tapestry or other media) being created in a permanent form for sale, have been traced to between 1945 and 1955. The main credit is generally given to a Navajo Hatałii named Fred Stevens, Jr. (Grey Squirrel), who developed the primary method of "permatizing" for commercial sandpaintings that is still used. Indigenous Australian art has a history which covers more than 30,000 years, and a wide range of native traditions and styles. These have been studied in recent decades and their complexity has gained increased international recognition. Aboriginal Art covers a wide variety of media, including sandpainting, painting on leaves, wood carving, rock carving, sculpture, and ceremonial clothing, as well as artistic embellishments found on weaponry and also tools. Art is one of the key rituals of Aboriginal culture. It was and still is, used to mark territory, record history, and tell stories about "The Dreaming". Aboriginal people have taken to transforming their tradition sand paintings into more permanent forms using modern techniques and materials. Geoffrey Bardon was an Australian art teacher who was instrumental in creating the Aboriginal art of the Western Desert movement, and in bringing Australian indigenous art to the attention of the world."... [directed by Bardon, the elders] began to interact with certain issues in 1960s and 70s international painting, especially the extreme schematisation of New York minimalism." In the History of Painting"Lyrical Abstraction in the late 1960s is characterised by the paintings of Dan Christensen, Ronnie Landfield, Peter Young and others, and along with the fluxus movement and postminimalism (a term first coined by Robert Pincus-Witten in the pages of Artforum in 1969) sought to expand the boundaries of abstract painting and minimalism by focusing on process, new materials and new ways of expression." This connection is seen most obviously in the connection between the paintings from the late sixties of Peter Young (artist) and the paintings that follow in the early seventies produced in the Papunya Tula. Papunya Tula, or Papunya Tula Artists Pty Ltd, is an artist cooperative formed in 1972 that is owned and operated by Aboriginal people from the Western Desert of Australia. Kaapa Tjampitjinpa is one of the early Papunya Tula artists and is known for Gulgardi. It is notable for being the first work by an Indigenous Australian artist to win a contemporary art award, and the first public recognition of a Papunya painting. Tibetan Buddhist sand paintings usually composed mandalas. In Tibetan, it is called dul-tson-kyil-khor (mandala of coloured powders). The sand is carefully placed on a large, flat table. The construction process takes several days, and the mandala is destroyed shortly after its completion. This is done as a teaching tool and metaphor for the "impermanence" (Pali: anicca) of all contingent and compounded phenomena (Sanskrit: Pratītya-samutpāda). The mandala sand-painting process begins with an opening ceremony, during which the lamas, or Tibetan priests, consecrate the site and call forth the forces of goodness. They chant, declare intention, mudra, asana, pranayama, do visualisations, play music, recite mantras, etc. On the first day, the lamas begin by drawing an outline of the mandala to be painted on a wooden platform. The following days see the laying of the coloured sands, which is effected by pouring the sand from traditional metal funnels called chak-pur. Each monk holds a chak-pur in one hand, while running a metal rod on its serrated surface; the vibration causes the sands to flow like liquid. Formed of traditional prescribed iconography that includes geometric shapes and a multitude of ancient spiritual symbols (e.g. : Ashtamangala and divine attributes of yidam), seed syllables, mantra, the sand-painted mandala is used as a tool or instrument for innumerable purposes. A primary purpose is to reconsecrate the earth and its inhabitants. When the meditation is complete, the sand painting is ceremoniously destroyed using a Vajra and the sand is then gathered and taken to a body of water for offering. From the 15th century in Japan, Buddhist artists in the times of the shōguns practised the craft of bonseki by sprinkling dry coloured sand and pebbles onto the surface of plain black lacquered trays. They used bird feathers as brushes to form the sandy surface into seascapes and landscapes. These tray pictures were used in religious ceremonies. Japanese esoteric Buddhism was transmitted from East Central Asia after the 8th century, and thus these Japanese Buddhist sandpaintings may share earlier historical roots with the more intricate brightly coloured Buddhist sand mandalas created by Tibetan Buddhist monks. During the 17th and 18th centuries, the royal courts of Europe employed "table deckers", who decorated the side tables at royal banquets having adapted the craft of 'bonseki' from the Japanese. The table deckers sprinkled coloured sands, marble dust, sugars, etc. upon the surface of plain white tablecloths to create unfixed pictures of fruit, flowers, birds and rustic scenery. In between each design spaces were left for fruit bowls and sweetmeat dishes so that the diners could refresh themselves in between the main courses of the feast. These ornate pictures were discarded along with the debris of the feast. As a fine example of the table deckers' craft, Woburn Abbey in Bedfordshire, England possesses an ornate folding screen with three panels, decorated with sand pictures protected by glass. The centre one has five spaces for sweetmeat pyramid dishes while the two side leaves of the screen have three spaces for fruit trays. There are four sand pictures in each corner of the side panels of the screen, featuring 18th-century pastoral scenes, while the remaining areas of the screen are decorated with butterflies, doves, fruit, flowers, etc. The screen would be laid upon the surface of a side table. It doubled as a serving base for elaborate porcelain dishes and glass trays containing fruits, bonbons and sweetmeats, from which the hosts and their guests could help themselves while socialising or stretching their legs between the multiple courses being served on the main table in the dining hall. 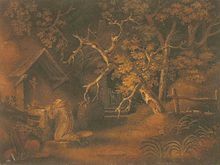 This screen may have been the work of the German artisan F. Schweikhardt, who specialised in still-life studies in the style of the Dutch painter Jan van Huysum. Sandpainting as a craft was inspired by King George III, who was a skilled watchmaker and craftsman in his own right, and took an interest in the skills demonstrated by royal functionaries, known as Table Deckers, who decorated the white table-cloths at royal banquets with ornate centre-pieces decorated by using unfixed coloured sands and sugars as 'paint', and a bird's feather as a 'brush' a craft introduced by a European traveller who had observed the craftsmen at work in Japan. It was while watching the table deckers at work the King suggested that if the sand pictures being temporarily laid out upon the surface of the tablecloths could be fixed permanently in place rather than being discarded with the remains of the feast, this would save much time and energy employing a multitude of skilled embroiderers toiling over such skilled work. So on one occasion the King bellowed to the craftsmen, "Why don't you fix it!" This set a number of craftsmen including Haas, Schweikhardt and Benjamin Zobel (Memmingen, Germany, 21 September 1762 - London, England, 24 October 1830), all of German origin, to, independently of each other, successfully develop suitable methods to achieve this goal, and these pictures were commissioned by the royal worthies of the day and became highly prized by the aristocracy. The King's brother, the Duke of York, commissioned a number of works by Zobel and the others, although the sand artists jealously guarded their method from their competitors. Zobel depicted "pigs in the manner of Morland"; "Nelson", the favourite dog of the Duke of York; "Tiger after George Stubbs", and an impressive "Vulture and snake." Although many of Zobel's works have survived, few of those by Haas have survived the passage of time, although observers considered his work superior to that of Zobel. This may reflect the differing techniques used by each artist. A diarist observed Zobel's coating the surface of the baseboard with a mixture of gum arabic and white lead and sprinkling sand upon the sticky surface using a folded paper funnel as a brush. He had to work quickly since the adhesive would dry in a few hours. Several of his surviving pictures have unfinished work on the reverse. Haas followed more closely the techniques developed in Japan, but mixing dry powdered gum arabic with the sand, sprinkling the mixture through a sieve and using feathers as brushes to create the pictures upon the baseboard, then fixing them by some method which he kept a secret. Due to the damp conditions in many of the stately homes of the day, his pictures failed to last more than a few years. On one occasion Haas was called away while working on an unfixed sand picture. When he returned he found one of Windsor Castle's cats curled up on the picture, thus damaging it! Eventually Zobel returned to Memmingen in Bavaria where he continued to successfully pursue his craft. Some of his work is displayed in Memmingen Town Hall. Haas was forced to give up sand painting, probably due to the ongoing disasters with his pictures. He opened a bakery in Windsor instead, and the icing on his cakes may well have been decorated with pictures in coloured sugar instead of sand. With the passing of these Georgian craftsmen and the disposal of the Duke of York's collection the interest and skills evolved in sand picture work declined. The only Royal personage to take further interest in the craft was the late Queen Mary, consort to King George V, who bequeathed her Georgian sand paintings to the Victoria and Albert Museum, and her collection of Isle of Wight sand pictures to Carisbrooke Castle Museum on the Isle of Wight. In the first half of the 20th century Lt. Colonel Rybot was a keen collector of sand paintings, which were the source material of the articles written on the subject in the arts and crafts magazines of the day. Eventually 37 of his collection of sand paintings were the main feature at an auction held at Sotheby's New Bond Street gallery on 15 June 1956. Thousands of sites exist where it is possible to collect natural coloured sands for craftwork, with an enormous range of colours being available around the globe varying with the contents of the mineral charged waters leaching through the sands. But for the tourist the vertical sand cliffs at Alum Bay on the Isle of Wight form the central portion of a visual geological phenomenon (best viewed after a shower of rain) which encapsulates the impressive chalk spires of The Needles and Tennyson Downs. Although tourists are no longer encouraged to obtain their own sand from the cliffs, numerous companies on the Island sell sand for the purpose of Sandpainting. After her marriage to Prince Albert and having chosen Osborne House near Cowes to be her new family retreat, Queen Victoria was the prime mover in the gentrification of this former backwater, local artisans benefitted from the influx of wealthy visitors, and a number of craftsmen sold their fixed sand pictures and unfixed sand jars featuring views of the Island as unique keepsakes of the Isle of Wight. Some of these sand pictures were small and crude and left unsigned, but Edwin and John Dore of Arreton produced some fine work in the 1840s. The pictures were of postcard size and the subject matter local views such as Carisbrooke Castle, and other touristy subjects. Edwin always signed his quaint pictures in a fine hand with a mapping pen and Indian ink, one of his most successful mass-produced subjects being 'Collecting birds eggs on Needles Cliffs'. John Dore used a card embellished with a printed border of lace design on which to execute his sand pictures although the quality of his work was inferior to that of his brother. Few of the Island sand artists filled in the sky, giving that detail a light colourwash as a finishing touch, sometimes leaving doors and windows free of sand which would be blocked in with Indian ink. In the 1860s and 1870s J. Symons of Cowes kept up the good work, producing local views much larger than postcard size, mounted in glazed oak or maple frames and signed with the artist's signature on the reverse. The father and son team the Neates of Newport sold their works from a stall outside Carisbrooke Castle gates where visitors were offered sand pictures and sand jars priced from 1/- to 2/6 each and the son grew his fingernails abnormally long in order to distribute the sand on his pictures. During the 1930s and 1940s R.J.Snow of Lake came nearest to producing sand pictures in the manner of the Georgian craftsmen, but postcard size, although he did produce some fine commissioned work, particularly a view of Oddicombe in Devon, in which the sea and sky were also 'painted' in sand, but after the war years the quality of the postcard sand pictures deteriorated with the mass-produced article with little taste or skill being offered for sale for a few shillings. In Senegal, designs are glued to board and are typically of figures in the landscape. In the 1860s to 1890s, Andrew Clemens a deaf mute born in Dubuque, Iowa, USA became famous for his craft of creating unfixed pictures using multicoloured sands compressed inside glass bottles or ornate chemist jars. The sand was collected from the bluffs overlooking the Mississippi River. The subjects of his sand bottles included ornately decorated sentimental verses, sailing ships, plants, animals and portraits. He exhibited his work at the St. Louis trade fair and having spent hours creating a picture in a bottle would demonstrate to an incredulous audience that the picture inside was unfixed by destroying the bottle with a hammer. Clemens' sand bottles have become museum pieces and highly prized antiques which have since sold at auction for thousands of US dollars. 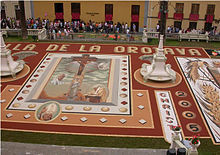 "Carpet" of land in the Town Hall Square in La Orotava Tenerife in celebration of Corpus Christi. In the province of Drenthe in the Netherlands in the late 19th, early 20th centuries it was custom to use a stiff broom to sweep patterns in white sand to form simple decorations on the tiled floors of the houses, mostly for special occasions or celebrations. The next day it was swept up. This custom was also practised in Northern Belgium by the Dutch speaking communities while in Hekelgem, 1973 was the centenary year of the craft of "Old Zandtapijt". The hotels and cafes would employ artisans to strew ornate sand pictures in unfixed coloured sands on the tiled floors of their premises to encourage passing tourists to halt and enjoy local hospitality on their way towards Brussels. Roger de Boeck, born in 1930, was a well-respected exponent of this craft, who used glue to fix his sand pictures to a suitable base selling them to visitors to his atelier. In addition to biblical scenes, his finest works included a portrait of Queen Elizabeth 1953, and US president John Kennedy, in the early 60s. This craft continues, and a booklet to celebrate the centenary was published on 1 February 1973. In modern days, sandpainting is most often practised during Dia de los Muertos (Day of the Dead) in Mexico and the United States. Streets are decorated with sand paintings that are later swept away, symbolising the fleeting nature of life. Of note are the sandpaintings done during the Seattle Dia De Muertos Festival, but the most exciting development has been the Performance Art of Sand Animation which has created a new wave of younger artists and also revived interest in all types of sand painting. A number of contemporary artists use sand in ways that depart from specific cultural traditions exploring techniques by raking sand, pouring it, carving it, creating unique designs. The works are ephemeral and are primarily shared through documentation or part of a live performance. Artist included in the exhibit that use sand and techniques related to sand painting were: Elvira Wersche, who collects sands from all over the world to create geometric patterned paintings, only to be destroyed as part of a performance. Andy Goldsworthy is known for his ephemeral works using nature, and began sand painting in 1986, documented the deterioration of a giant ball of sand on the beach packed with bones for the exhibit. 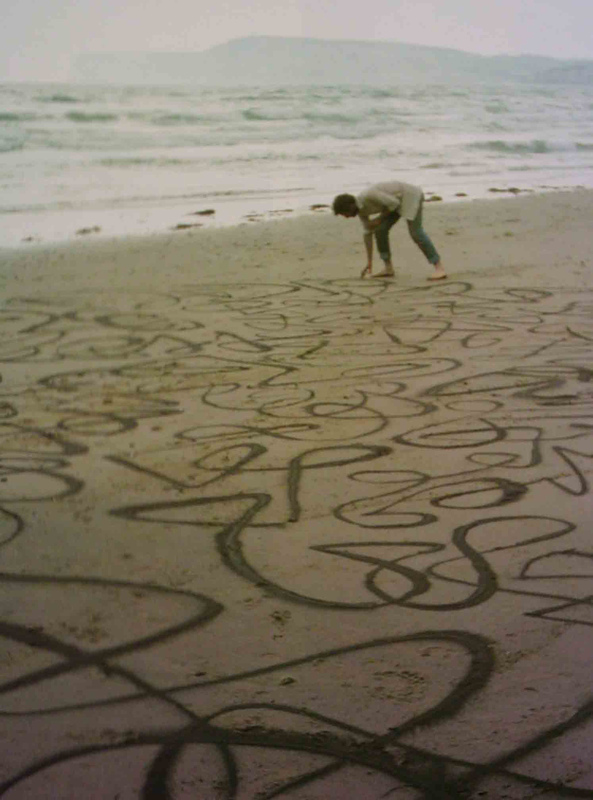 Jim Denevan known for his massive raked sand paintings also shared documentation of his process on California beaches. Igor Eskinja used dust to paint an architectural floor plan in the galleries. Cui Fei produces calligraphic works in sand using tradition chak-pur and brushes. Vik Muniz uses dust, chocolate syrup, grains of sand, sugar, caviar, magazines and industrial garbage in a way that reflects sand painting. The rotating exhibit "Swept Away Projects" featured Linda Florence and Joe Mangrum whose works were added to the galleries after removal of previous works. Linda Florence used chalk to stencil patterns onto the floor and often uses various materials like sugar to create installations. Joe Mangrum poured coloured sand from his hand for two consecutive days on 8–9 May 2012 he titled "Asynchronous Syntropy" and an outdoor project that acted as a circumambulation of the museum itself. Mangrum worked a total of 24 hours over the span of two days, spontaneously improvising his sand painting design, only to have it quickly disappear under the bustle of Columbus Circle foot traffic. Other contemporary artists who work with sand include Andrew van der Merwe, based in Cape Town, who carves calligraphic imagery into the sand on beaches; Andres Amador, an American artist who rakes designs into beaches; Ahmad Nadalian, an Iranian artist who uses natural ground pigments to paint with sand; and Motoi Yamamoto, who makes paintings reflecting typhoons and natural phenomena using salt. ^ Directory, Aboriginal Art. "Ngurrara: The Great Sandy Desert Canvas Australian Aboriginal Art Feature at the Aboriginal Art Directory. View information about Ngurrara: The Great Sandy Desert Canvas". www.aboriginalartdirectory.com. ^ Movers and Shakers, New York, "Leaving C&M", by Sarah Douglas, Art and Auction, March 2007, V.XXXNo7. ^ a b "Museum of Arts and Design Collection Database". Collections.madmuseum.org. Archived from the original on 2014-02-02. Retrieved 2014-05-01. ^ "Museum of Arts and Design Collection Database". Collections.madmuseum.org. Archived from the original on 2012-01-28. Retrieved 2014-05-01. ^ "Mite Makes Right". ARTnews. Retrieved 2014-05-01. ^ "Modern mandalas: a guest post on the stunning art of Elvira Wersche - Through The Sandglass". Throughthesandglass.typepad.com. 2011-08-02. Retrieved 2014-05-01. ^ "Elvira Wersche, Electron". YouTube. Retrieved 2014-05-01. ^ "Andy Goldsworthy Digital Catalogue: 1983_127". Goldsworthy.cc.gla.ac.uk. Retrieved 2014-05-01. ^ "YouTube". YouTube. Retrieved 2014-05-01. ^ "Amazing Sand Drawings on California Beaches". Bored Panda. 2011-07-20. Retrieved 2014-05-01. ^ "Museum of Arts and Design Collection Database". Collections.madmuseum.org. Archived from the original on 2014-02-02. Retrieved 2014-05-01. ^ "VIDEO: Chinese Artist Cui Fei Traces Her Philosophical Sand-Paintings at MAD | BLOUIN ARTINFO". Origin-www.artinfo.com. 2012-08-12. Archived from the original on 2014-02-02. Retrieved 2014-05-01. ^ "Vik Muniz » Arts at MIT / Artists". Arts.mit.edu. Retrieved 2014-05-01. ^ "10 Most Creative Artworks Made From Unexpected Materials By Vik Muniz | The Most 10 Of Everything". Themost10.com. Retrieved 2014-05-01. ^ "New, Temporary Floor Installations Added to 'Swept Away' Exhibit at MAD Museum". Arts Observer. Retrieved 2014-05-01. ^ "Installations |". Lindaflorence.me.uk. Retrieved 2014-05-01. ^ "Sand Painting at Columbus Circle". Hyperallergic.com. 2012-06-08. Retrieved 2014-05-01. ^ "Bow Down To This Stunning, Ephemeral Sand Calligraphy". Huffingtonpost.com. 2013-08-13. Retrieved 2014-05-01. ^ 23K views (2012-03-21). "Stunning Sand Drawings by Andres Amador". Bored Panda. Retrieved 2014-05-01. ^ "Morning Earth Artist/Naturalist Ahmad Nadalian". Morning-earth.org. 2007-02-14. Retrieved 2014-05-01. ^ "Monterey Museum of Art Hosts Return to the Sea, Saltworks by Motoi Yamamoto « Monterey Museum of Art". Montereyart.org. Archived from the original on 2014-04-23. Retrieved 2014-05-01. ^ "Sand Art Made From Salt - Return to the Sea". Videosift.com. Retrieved 2014-05-01. Villasenor, David. Tapestries in Sand: The Spirit of Indian Sandpainting. California, Naturegraph Company, Inc. 1966. Arthur Morrison. Japanese Sand-Pictures pp. 609–612. Strand Magazine,1909. G. B. Hughes. Decorating the Georgian Dessert Table. Country Life, 21.5.1959. Fred Lee Carter. The "Lost Art" of sandpainting pp. 215–221. The Connoisseur Illustrated, 1927. Fred Lee Carter. Sand Pictures. Notes and Queries, 8.12.1928. E. McCoy. Pictures Painted with Sand. Antiques, March 1936. Bea Howe. Sand Pictures. Homes and Gardens, April 1940. D. A. Ponsonby. A Sand Painter and Morland pp. 111–113. The Connoisseur-American Edition, April 1955. S. Groves. They Painted in Sand. The Lady, 22.1.1959. J. Toller. The Regency and Victorian Crafts. Ward Lock, 1969. C. P. Woodhouse. The Victoriana Collectors Handbook. Bell, 1970. Bea Howe. Antiques from the Victorian Home. Batsford, 1973. J. Field. Victorian Crafts. Heinemann, 1973. Brian Pike sand painter. Painting with Sand-Golden Hands Crafts-vol.70. Marshall Cavendish, 1976. Joyce Eley. Sand Pictures. Wight Life, Oct-Nov. 1974. A. H. Trelawny. Keepsake Castles in the Sand. Country Life, 2.2.1995. Etienne le compte. 1873 - 1973 Oud Zandtapijt published Hekelgem 1 February 1973. Villasenor, David & Jean. How to do Permanent Sand Paintings. Villasenor, David & Jean, 1972. K. Beese. Sand Painting Techniques. Design 60, 1959. P. Nelson. Sandpainting. Creative Crafts, April 1974. Brian Pike. Sand Art.Family Circle Book of Crafts, 1980. Brian Pike. The Craft of Sand-painting.The Craftsman Magazine, 1989. Wikimedia Commons has media related to Sand painting.